As professional world wide shippers, we are very proud to work with many galleries located all over the United States, shipping fine art for them and their clients globally. For example, if you check out the list of our clients, you will find there Art d’Aurelle, Clic Gallery, Peanut Gallery, and many other great galleries offering exceptional pieces of modern and contemporary art. What makes our team of world wide shippers unique? First of all, we are experts in packing and shipping artwork of any size, weight, and shape, not to mention our extensive experience in art installation and exhibition set-up. Secondly, at Fine Art Shippers, we all love art and never miss a chance to visit different art galleries offering interesting art pieces by talented artists. In this blog post, we want to introduce one of these galleries – the amazing Gallery Victor Armendariz in Chicago, IL! 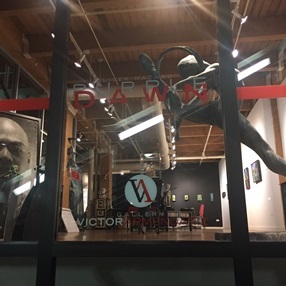 Gallery Victor Armendariz is a relatively new fine art gallery located in the very heart of Chicago’s River North art and design district. Founded by Victor Armendariz in 2017, this fantastic gallery has already proven to be a go-to place for all connoisseurs of contemporary art by both emerging and established artists. For today, Gallery Victor Armendariz offers artworks by Rose Freymuth-Frazier, Cristina Cordova, Oliver Hazard, Tom Huck, Gail Potocki, and many other international artists working in various mediums. Besides, this beautiful gallery features works by the renowned steel furniture maker Jim Rose. Highly recommended by our team of world wide shippers!